My first degree (back when I could afford to study out of interest) was Theology and Religious Studies. I’d told people I was studying this subject because I wanted to be a diplomat, but a big part of it was the traces that previous iterations of civilisation have left scratched, carved and drawn in the world. Look at many temples, or even cave paintings, and the depiction you find is often of violence. It might be a Hanuman carving of a battle against demonic forces (Thailand), a beheading (the Sistine Chapel, Rome) or arrows being launched at galloping animals (cave paintings, France). These artistic portrayals of violence are reminiscent of the rapid cuts and flashes seen in the fight scenes of Raging Bull where the freeze frame is chosen as the most dramatic and telling part of the whole physical sequence. This was particularly fascinating to me as I’ve always studied some form of martial art. First it was Karate, then fencing at university (I even won a medal for that one), then Mongolian wrestling in China, Taikwondo with the air force in Oman, and most recently boxing. All of these come with books of some description that in many ways mirror their artistic counterparts in that they freeze the action at the most telling moment. 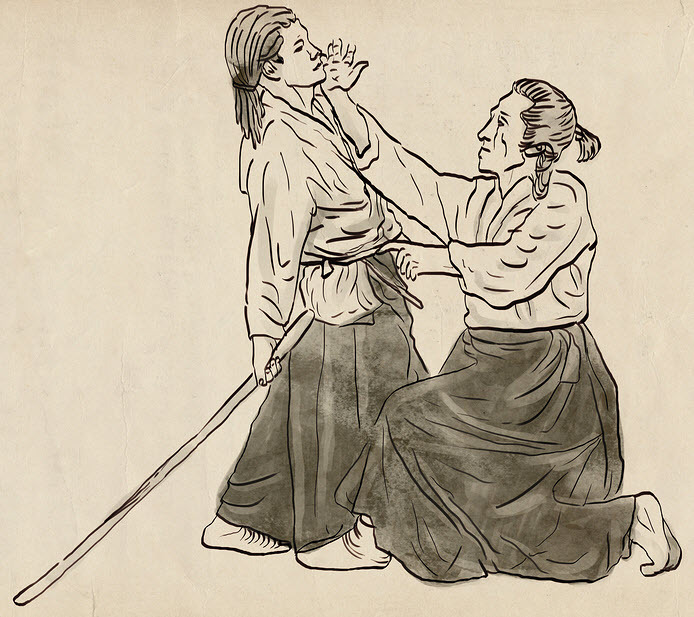 An example from an early Aikido manual is given here. In this picture the combatant on the right is defending himself against an armed aggressor. The scene is frozen at the moment of impact. Artistically this is all well and good, but what else can we see from this image that is of use for technical authors? I’m reminded of a style guide I recently encountered that stated “When accompanying an instruction with a screenshot, the mouse pointer should be displayed carrying out the task.” In this case the mouse pointer is the right hand as it strikes below the chin. The defender has stepped in with his left leg and lowered his centre of gravity to make himself more difficult to engage with a long bladed weapon. This is shown without any real need for explanation as any martial artist will tell you, footwork eventually becomes reflex. In the same way there are things that we don’t bother to screenshot or explain in great detail as we assume that if the end user cannot turn their PC on, they’d hardly be reading the manual for a complex system. In this drawing, our defender has a single finger hooked at the waist of his attacker to off-balance and drag the swordsman forward onto his strike. 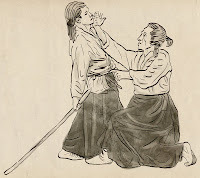 This is artistic emphasis: the actual move requires a handful of belt, clothing and man to be grabbed in a fist and bodily hauled towards the defender, but when drawn this would look too much like a second fist striking the target and so the single hooked finger is drawn to emphasis the pulling action. This and other stylistic elements are found again and again in hand drawn martial arts manuals. They are not dissimilar to the refined vocabulary used to describe on-screen processes (interestingly the cursor sometimes morphs into a hand with a single extended digit to reflect an action in much the same way). Revisiting the Sistine Chapel, we see Goliath’s final moment captured. As anyone who’s ever chopped wood or swung a hammer will tell you, the moment to get right is the top of the swing when all the force and balance and energy is about to be released. David is exemplary: his shoulder is cocked, his wrist open and his whole trunk unwound ready to deliver the blow. Goliath is as good as dead, as if the blade had already completed its gore-punctuated descent. As technical authors, we should aim to capture this exemplary and telling moment as well as the final static outcome in what we write and display.